The neighbourhood of Notting Hill today is a vibrant, exuberant and colourful reflection of its heady, diverse, rich and multi-cultural past. An eclectic mix of people, places and attitudes give this affluent and fashionable area a unique vibe, combining both the bohemian and the traditional. International financial traders rub shoulders with artists, musicians and writers in the many coffee shops, bars, and restaurants or behind handsome stucco-fronted pillar-porched houses, pretty mews dwellings and of course, regular flats. Nowhere is this spirit better exemplified than with the annual Notting Hill Carnival in August or every weekend down the Portobello Road, included in this list of top ten things to do in Notting Hill. World famous market and pulsating heart of Notting Hill, primarily known for its antiques and vintage and second-hand clothes stores although nowadays becoming better known for as a foodie destination. Some pretty hip, independent clothing stores still to be found, including the incredible ‘One of a Kind’ at #259 with vintage dresses that are worn by A-list celebrities to major events; you don’t need to be a celebrity, but you will need to book if you want to enter. Best days to visit the market are Friday and Saturday and the closest tube is Notting Hill Gate, Ladbroke Grove or Westbourne Park. Notting Hill: Portobello Road Market. Photo Credit: © James Hamill. 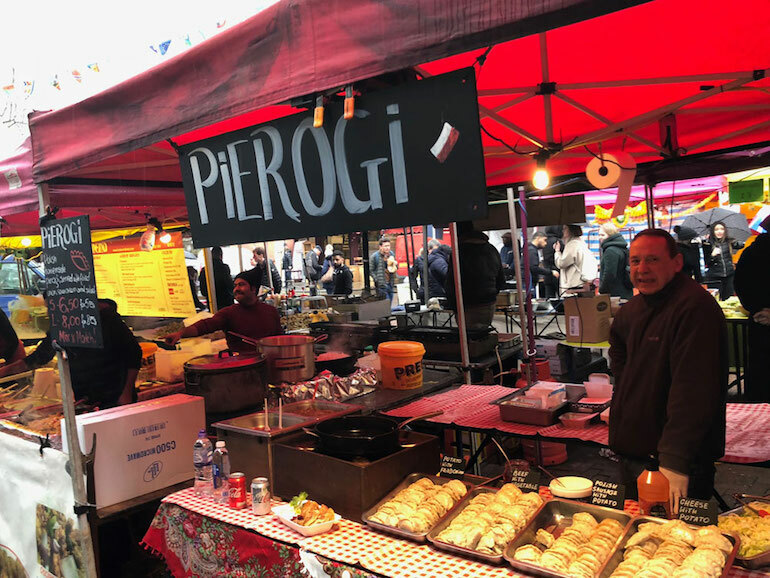 Just off Portobello Road at the corner with Cambridge Gardens is an area crammed full of the most incredible food stalls, covering every cuisine from Afghan to Zambian. Aim for the cool ska/reggae/jazz sounds and then follow your nose to epicurean overload. Enter the village area and look out for the very unique Bay 58 bar and often with live music playing there too. Also look out for an original Banksy mural ‘Graffiti Painter’ just against at the corner of Cambridge Gardens and Portobello. It is very likely to be hidden behind food stalls at the weekend but with a bit of perseverance, you should find it. Notting Hill: Acklam Village. Photo Credit: © James Hamill. 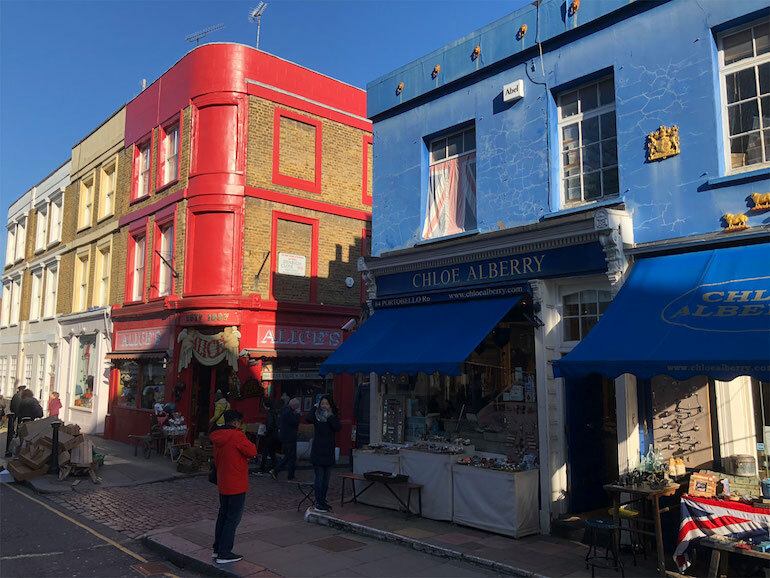 Whilst Portobello Road is the most famous, for my money Golborne Road market is where it’s at and the locals describe it as how Portobello used to be. Some incredible stores, selling truly unique merchandise, for example, Universal Providers at #86 and Les Couilles de Chien at #65. A very strong Moroccan and Portuguese influence here and if you really want to hang out with the locals, I suggest a ‘coffee in a glass’ from Café O’Porto. Interesting Scandinavian coffee shops compete with bric-a-brac stalls on the streets. 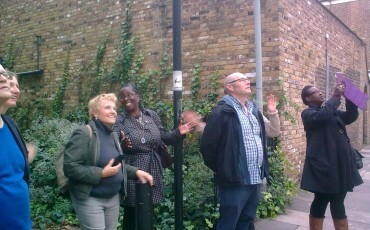 Look out for the 2 resident seagulls that have become a feature of the area. 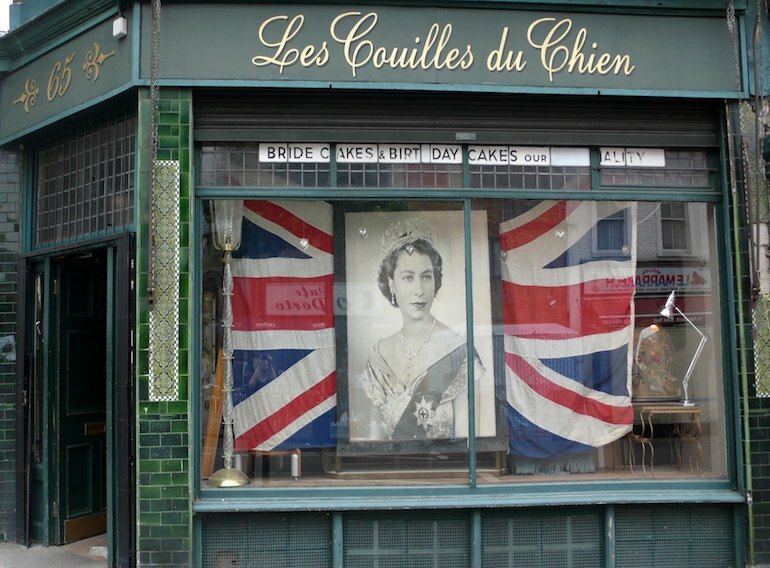 Notting Hill: Golborne Road Market – Les Couilles de Chien shop front. Photo Credit: © Les Couilles de Chien. A small hidden enclave of Notting Hill located immediately behind the Coronet Cinema on Notting Hill Gate itself and containing streets of colourfully painted terraced houses. Now regarded as exclusive and chic but when they were completed back in the mid-1800s, they formed part of the poorest of slums with up to 32 people living in each house. At one end is a rather unprepossessing car park which is transformed on a Saturday morning to one of the finest Farmers Market with top quality locally sourced produce. Whilst you are there, check out the Geales Restaurant, a Notting Hill institution serving fish and chips for over 70 years. Notting Hill: Hillgate Village. Photo Credit: © James Hamill. Bordering the edge of Notting Hill, this is one of the nicest parks in the capital. 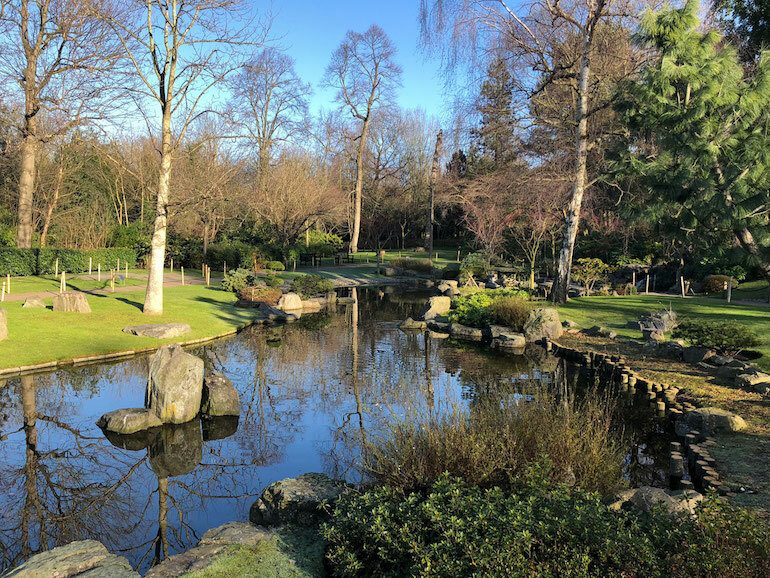 Wander through an idyllic semi-wild woodland, sample the serenity of the Kyoto garden with a lake full of beautiful Koi Carp and peacocks strutting their stuff or take in the formal gardens of Holland House, bombed in the War and which provides a wonderful backdrop to Opera staged throughout the summer. There are two well-equipped children’s playgrounds designed to cater for different age groups. There are great cafés and some wonderful sculpture too; look out for the ‘Walking Man’ who seems a rather pensive and thoughtful character. Notting Hill: Holland Park. Photo Credit: © James Hamill. 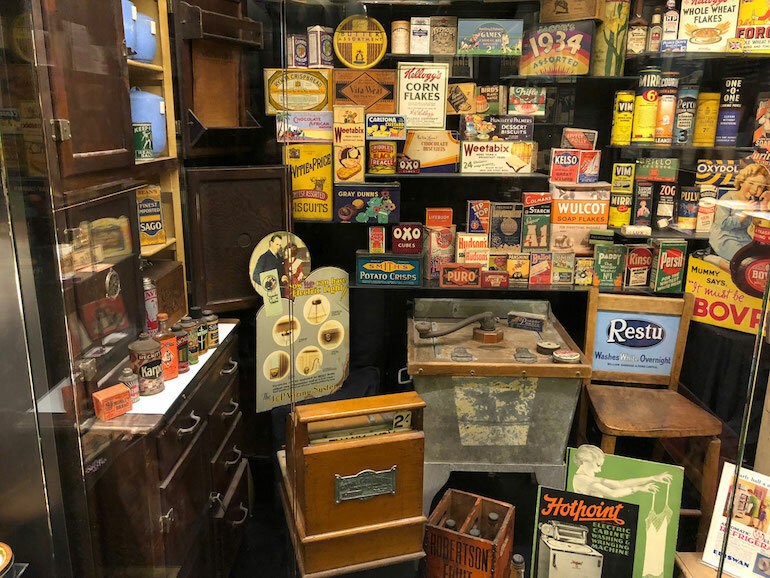 Over 12,000 original items are brought together in this informative and entertaining visual feast in which objects and brands are invitingly displayed in a ‘Time Tunnel’ that brings the visitor on a journey from Victorian times through to the present day. Partly nostalgic and partly eye-opening – toy soldiers made of lead and Victorian play kitchens with cookers using methylated spirits come to mind – a great way to spend an hour or so. Don’t forget to make time for a coffee in the beautiful garden around the back. Notting Hill: Museum of Brands, Packaging and Advertising. Photo Credit: © James Hamill. A huge variety of films have used the streets and venues of the area of for their locations. From the famous ‘Blue Door’ in the eponymous film Notting Hill, to St Luke’s Mews used for the scene with cue cards in Love Actually. More recently the Paddington films feature too, as well as older titles as varied as Bedknobs and Broomsticks and Performance with Mick Jagger. But did you know that the villain of the 1964 James Bond film Goldfinger was named after the architect Ernő Goldfinger who created one of our famous landmarks, the Trellick Tower? 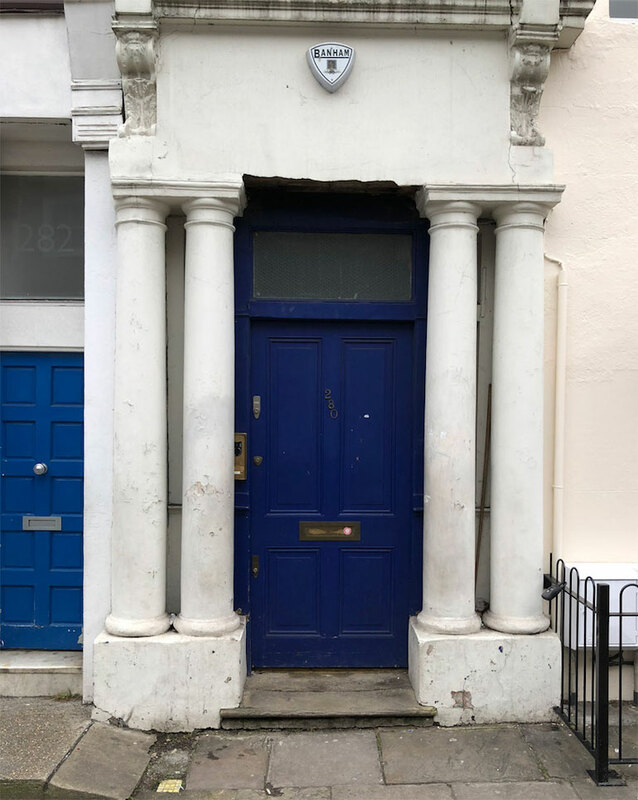 Notting Hill: Blue Door from Notting Hill Movie. Photo Credit: © James Hamill. One of London premier skateboarding parks which occupies a huge space under the Westway, the overhead section of the A40 motorway that cuts through the northern part of Notting Hill. An institution amongst the skateboarding fraternity, it consists of 3 main sections that provide something for everyone – there’s a bowl, park/street area and beginners section for those still learning. BMX access is restricted for safety reasons but there are exclusive sessions at regular times during the week. Notting Hill: Bay Sixty 6 Skate Park. 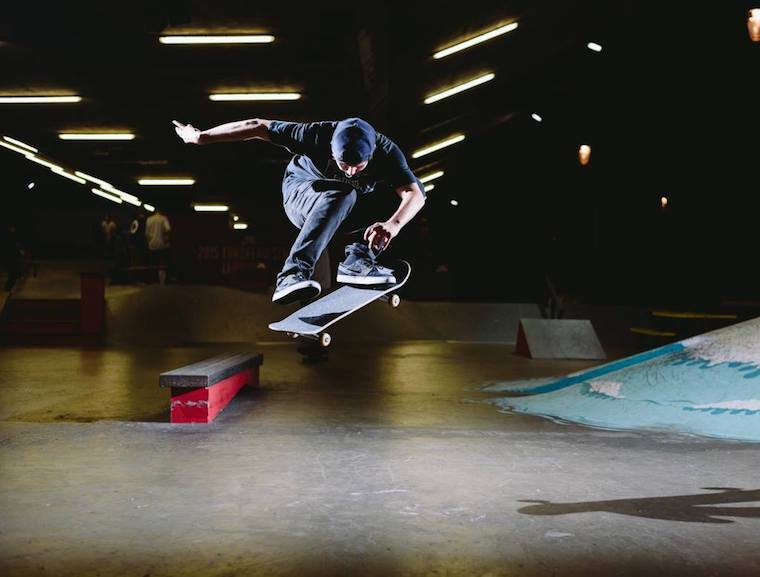 Photo Credit: © Bay Sixty 6 Skate Park. A beehive kiln just north of Pottery Lane gives a reminder of the history of this area. Hard to believe nowadays that it was one of the worst slums in London, known both as ‘Cut Throat Lane’ and as the ‘Piggeries and Potteries’ because of the pig-keepers who had been forced to move here as London expanded and because the soil at the time was almost entirely composed of stiff clay used for making bricks. With no sanitation and a life expectancy of 11 years and 7 months, it was a described by Charles Dickens as ‘a plague spot scarcely equalled for its insalubrity by any other in London’. The kiln itself has now been converted into a 3-bedroom house. 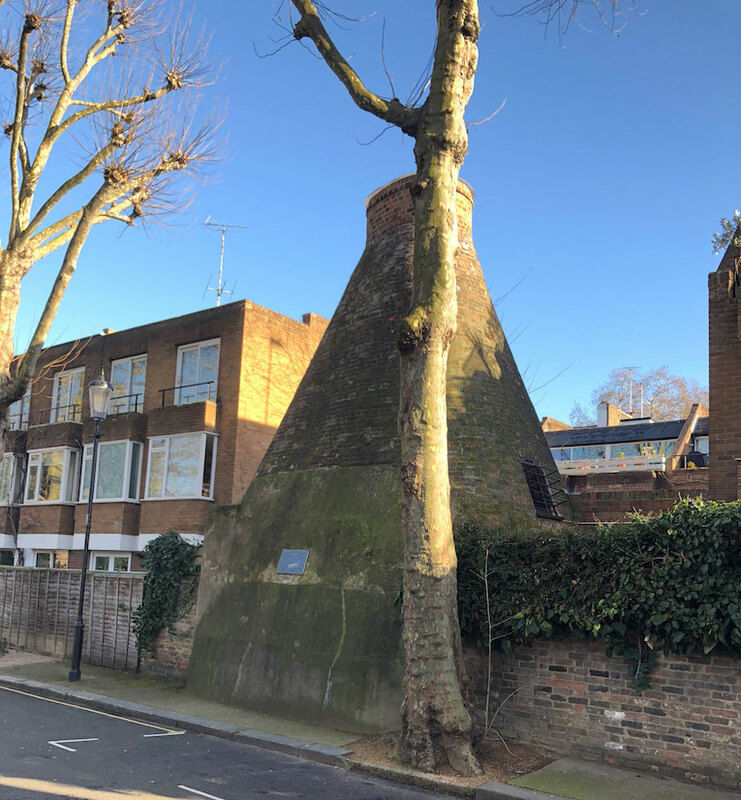 Notting Hill: Beehive kiln just north of Pottery Lane. Photo Credit: © James Hamill. Without a doubt, Notting Hill Carnival is Europe’s biggest street party and a fantastic, joyful celebration of Black British culture. Over a million people descend on the streets of the Notting Hill over two days in late August and if you are lucky enough for your visit to coincide with this, expect to see a dazzling display of eye-catching, brilliant costumes against a backdrop of some of the greatest tunes as well as a plethora of sound systems and food stalls. The whole event kicks off with Panorama, the steel band competition that takes place the Saturday before Carnival begins at Emslie Horniman Pleasance Park. This is Carnival at its purest and a great event for all the family to enjoy, away from the crowds. Alternatively, the practice sessions on All Saints Road the Thursday and Friday evening before are unforgettable too. Notting Hill Parade masquerade participant. Notting Hill: Notting Hill Parade masquerade participant. Photo Credit: © Ursula Petula Barzey. 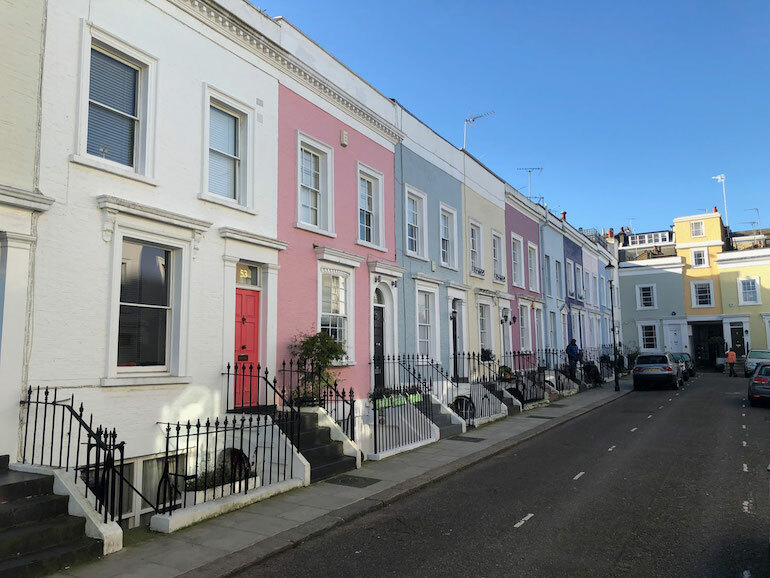 Blue Badge Tourist Guides really are the best way to get more from your Notting Hill tour because we live and breathe the venues, places and spaces we bring you. We look forward to meeting you and showing you the best that Notting Hill has to offer. 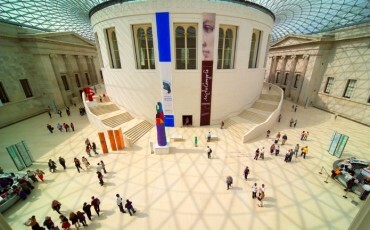 I would like to take you on a tour of London – one of the most exciting, vibrant and cosmopolitan cities in the world. 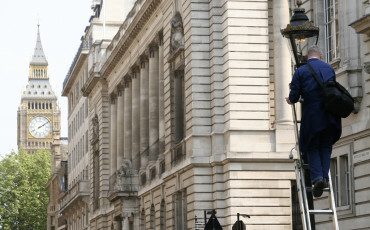 What a treat it was to inspect gas lamps around Westminster last November with Ian and Garry from British Gas, who love their lamps. They clean and polish them, feel pain when one gets smashed by a passing truck and complained to the Royal Parks who repainted lamps in St. James’s Park without gold paint. Lamps are listed by English Heritage so if one gets knocked down, it must be replaced with an exact copy. Below are some more interesting facts as shared by Ian & Garry while on this education and training tour for Blue Badge Tourist Guides. A Scottish couple down in London for the day, the Chair of Tower Hamlets Labour Party, a Sri Lankan woman attending a course in London, the UNITE officer for Tilbury dock workers and a German speaking Blue Badge trainee – all came along together with many others, including many Blue Badge Tourist Guides, to the tailor-made walking tours commemorating the 125th anniversary of the Dockers’ Strike in 1889.